I let my broke down 1999 Chevy Tahoe sit in my garage for five weeks before making a final decision to get rid of it. The 4L60E automatic transmission had seriously failed. I am usually not that thoughtful, but I liked my truck. Gas prices tipped my decision in favor of selling it and getting a more economical vehicle. At the time gasoline prices were pushing $4.00 a gallon. I bought the Tahoe because it had four wheel drive which made it perfect for driving on the beach on Padre Island. I did that a few times, but not nearly as often as I had planned. I placed ads in Craigslist for a couple weeks with nothing but curious inquiries. The fact that it couldn’t be driven at all seemed to be an immediate deal breaker. Had I tried to sell it while it could still be driven I think I would have had more interest. I was only asking $500.00 for my Tahoe, not bad for a four wheel drive vehicle with a nearly new set of tires. It was worth that to the right person, but finding the right person proved difficult. My next thought was to try to sell my Tahoe on eBay, but for whatever reason I put this search phrase in Google: how do I sell a damaged truck? I found an ad for DamagedCars.com. I really wanted to get the Tahoe out of my garage and I wasn’t all that optimistic about eBay. I completed their online form, took the pictures, and submitted my Tahoe for a bid. It was late on a Friday night and I wasn’t optimistic that I would get a reply. On Saturday afternoon I checked my email and there was an offer from DamagedCars.com for $850.00. DEAL? You bet your sweet behind! DamagedCars.com is located in Florida. They sent me a contract by overnight mail. I completed and signed the contract. They required that I sign the title over to them. I had the title in hand, but I was hesitant to sign the title over to a company in Florida without some kind of money in hand. I called the DamagedCars.com office, fussed a little, but the deal was only good on their terms. They weren’t going to do the deal without a transferred title in their hand. I expressed the contract and signed title to Florida. A couple days later I got a call from a local towing company telling me they had a check for me and instructions to pick up my Tahoe. We made an appointment for Friday, which was one week after I completed their online form and sent the pictures. The tow truck arrived as scheduled. The driver and I pushed the Tahoe out of my garage and he loaded it on his truck. He gave me a check, actually two checks, totaling $850.00. He hauled off the truck and I deposited the checks. 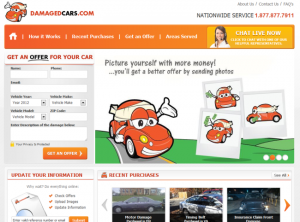 I think the business model is something like this; DamagedCars.com finds the cars through online inquiries from their website. They then negotiatea price with the buyer that is basically a wholesale price. After they have the title they sell the car to a local Copart salvage yard for a profit. Good for them. It was good for me. Highly recommend!